D-Link Boxee Box review | What Hi-Fi? In the streamer spectrum, the D-Link Boxee Box is full-on brain surgery next to the Apple TV’s GCSE biology. In the streamer spectrum,the D-Link Boxee Box is full-on brain surgery next to the Apple TV’s GCSE biology. That’s not to put it down. One of the frustrating things about the Apple is that it’s a walled-garden product: want to play your own files? You’re out of luck, pal. 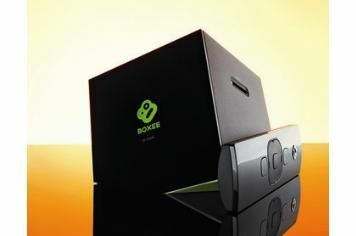 The Boxee throws open its doors and welcomes all-comers. And it will play them from a USB drive, over a network, from an SD card, via its integrated web browser and even via a VPN. And yet the Boxee’s biggest strength is also its greatest weakness. In its admirable quest for format agnosticism, it’s become tweaky, techy and difficult to configure. We’re all for open format support, but not at the expense of usability. The interface, while slick-looking, doesn’t put anything where you expect it to be. There’s a ‘Movies’ icon, behind which you can find a colourful grid of metadata-packed, cover-art-emblazoned items; but if you want to access your tunes, it means paying a visit to the ‘Files’ area – and trawling through a list of computery file-names. It won’t find cover art and metadata (or recognise our TV’s resolution and colour settings) automatically. It shouldn’t take 15 minutes to configure one of these devices, it should take three. Get over the frustration of using a menu system that appears to have been designed by a programmer rather than an interface guru, however, and things pick up considerably. There’s a wealth of apps on offer – including BBC iPlayer, Facebook, Spotify, Netflix and Crackle, among hundreds of others. The device takes internet-based and locally stored content and displays it in a top-level menu – the idea being that the line between ‘stuff on your hard drive’ and ‘stuff out there on the internet’ doesn’t need to exist. You can even use more than one NAS – the Boxee will incorporate them into its single library. Of course, with so much media available at your fingertips, a normal remote control won’t cut it for searching. So while Apple TV owners are turning the air blue trying to search for Borat: Cultural Learnings Of America For Make Benefit Glorious Nation Of Kazakhstan using their thumb, you’re well into the film before they’ve got to the letter ‘K’, after using the qwerty keypad on the Boxee’s remote control . The Boxee supports a vast array of formats – pretty much every video file you can throw at it, and even high-resolution audio up to 24-bit/192kHz. We can’t grumble about the picture quality, but the sound is a little lifeless. We can’t fault this box’s abilities when it comes to network friendliness, file support or content availability – but it’s a bit of a pig when it comes to usability, compared with newer devices. A media player shouldn’t be so annoying to use – and that’s what lops stars off its rating. That’s not to put it down. One of the frustrating things about the Apple is that it’s a walled-garden product: want to play your own files? You’re out of luck, pal.The Boxee throws open its doors and welcomes all-comers. And it will play them from a USB drive, over a network, from an SD card, via its integrated web browser and even via a VPN. And yet the Boxee’s biggest strength is also its greatest weakness. In its admirable quest for format agnosticism, it’s become tweaky, techy and difficult to configure. We’re all for open format support, but not at the expense of usability.The interface, while slick-looking, doesn’t put anything where you expect it to be. There’s a ‘Movies’ icon, behind which you can find a colourful grid of metadata-packed, cover-art-emblazoned items; but if you want to access your tunes, it means paying a visit to the ‘Files’ area – and trawling through a list of computery file-names. It won’t find cover art and metadata (or recognise our TV’s resolution and colour settings) automatically. It shouldn’t take 15 minutes to configure one of these devices, it should take three. Get over the frustration of using a menu system that appears to have been designed by a programmer rather than an interface guru, however, and things pick up considerably. There’s a wealth of apps on offer – including BBC iPlayer, Facebook, Spotify, Netflix and Crackle, among hundreds of others. The device takes internet-based and locally stored content and displays it in a top-level menu – the idea being that the line between ‘stuff on your hard drive’ and ‘stuff out there on the internet’ doesn’t need to exist. You can even use more than one NAS – the Boxee will incorporate them into its single library. Of course, with so much media available at your fingertips, a normal remote control won’t cut it for searching. So while Apple TV owners are turning the air blue trying to search for Borat: Cultural Learnings Of America For Make Benefit Glorious Nation Of Kazakhstan using their thumb, you’re well into the film before they’ve got to the letter ‘K’, after using the qwerty keypad on the Boxee’s remote control . The Boxee supports a vast array of formats – pretty much every video file you can throw at it, and even high-resolution audio up to 24-bit/192kHz. We can’t grumble about the picture quality, but the sound is a little lifeless.We can’t fault this box’s abilities when it comes to network friendliness, file support or content availability – but it’s a bit of a pig when it comes to usability, compared with newer devices. A media player shouldn’t be so annoying to use – and that’s what lops stars off its rating.